Sukh Hotel is well-known world over for its Efficient, Personalized and Professional services to their Valuable Guests majority of whom found it a perfect and enjoyable “Home Away From Home”. Their repeated visit and enjoying warmth and hospitality to the hotel makes the management proud of them and gives it a pleasure to serve them better and better and to take care of them in every respect including their personal safety and security. 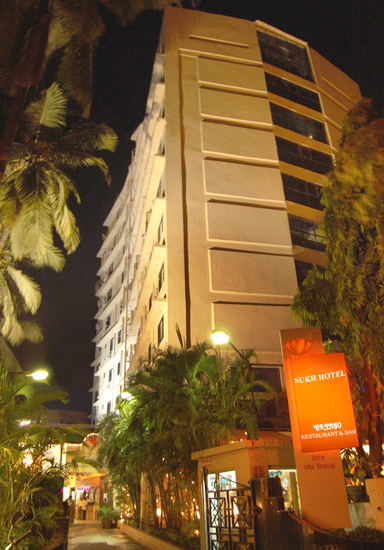 As name implies – Sukh Hotel which is a three star hotel is looking forward throughout all seasons of the year to welcome guests visiting Mumbai for holidays, business, rest, specialized medical treatment and transit etc. in the hotel for its comfort, warmth, pleasure and Indian hospitality. Situated at Mumbai’s famous Juhu Beach and easily accessible from Mumbai airports both Domestic and International. The courtesy coach of the hotel provides free transport from and to the airports for the guests. Hare Krishna Temple which is popular amongst majority of the overseas visitors is close to the hotel and could reach within few minutes walking. The shopping facility with variety of choices and is known for biggest shopping market is at linking road which is hardly 3 kms away from the hotel. Local transport in metered taxis, auto rickshaws, city buses are easily available. The hotel provides 64 beautifully decorated, well furnished air-conditioned rooms and suites. From the rooms the guests can have magnificent sea – view. Colour T.V with satellite channels, direct dial local telephones with ISD and STD facilities, Personal refrigerators in each room. Direct dial local telephone with ISD and STD facilities, Wi – Fi Connectivity, Business Center. Safe deposit lockers in each room, are some of the main facilities in the guests rooms besides other amenities befitted to its status. Through every season, there’s one 3 – star hotel waiting to welcome you with comfort, warmth and pleasure – Sukh Hotel. Situated on Mumbai’s famous Juhu Beach. 3kms from the Domestic Airport, 6 kms from the International Airport, 1.5 kms from Vile Parle Railway Station. 3 kms from Linking road, One of Mumbai’s biggest Shopping Markets and 20 kms from the downtown area.